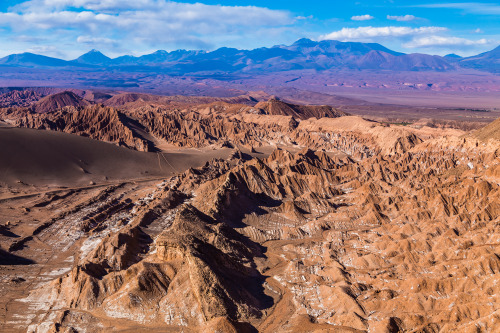 The Atacama Desert provides an ideal environment for solar power (image courtesy of Shutterstock).
] Atacama 1 (image courtesy of Abengoa). 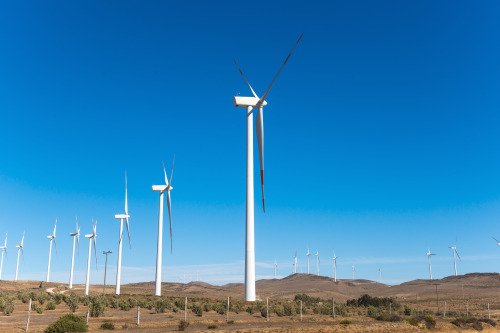 A Chilean wind farm based in the North (image courtesy of Pablo Rogat via Shutterstock). Chile is aiming to produce 70% of its energy using renewable sources by 2050. This will provide European companies and investors with significant opportunities, says Santander’s Latin American Desk Head, Mauricio Munguia. Driven by the pledges made at last year’s COP21 climate change conference in Paris, economies across the globe are decarbonising; increasing the proportion of renewable sources in their energy mixes. Indeed, last year saw record global clean energy investment, reaching £198 billion from £100 billion the year before, according to the REN21 global status report. Yet hurdles to decarbonisation remain, of course, with a key one for governments and investors being the intermittence of power supply of renewables; what happens when the sun stops shining and the wind stops blowing? Chile rarely has this problem. The Atacama Desert, located in the north of the country, has unique radiation levels ideal for solar power, while 6,000km of coastline provides favourable winds. Add to the mix 123 active volcanoes and Chile’s renewable energy market is teeming with potential. What’s more, the Chilean government has taken up the renewables baton –with the aim to produce 70% of the country’s energy from renewable sources by 2050. Such goals no longer seem unachievable. Backed by enabling policy and energy market reform, the share of wind, solar and biomass in Chile’s energy mix has risen from 1% to 11% over the past eight years. Encouragingly, the country is adding around 600MW to its energy grids each year. When you consider that the country’s GDP growth has outstripped most on the continent, and that it has little corruption and solid institutional and regulatory frameworks, you can see why institutional investors across Europe – many of which are keen to add sustainable investments to their portfolios – are starting to “think Chile”. Furthermore, Chile leads the way globally in terms of energy market reform – enabling intermittent renewable suppliers to bid on specific slots corresponding to times during the day and night. Furthermore, it has restructured its energy supply auctions, and established a tax on carbon emissions. All of this has allowed renewables to compete head-to-head with fossil fuels, without the need for direct subsidies. This has buoyed investors and renewables companies, with many seizing the opportunity to participate. Since 2012 alone, we have seen commitments of US$9.2 billion. And in 2014, 12 deals secured investment of US$3.4 billion, largely driven by solar projects. 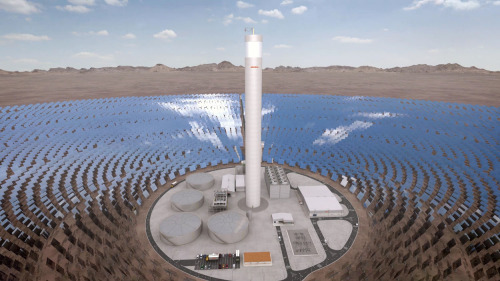 The headline-maker of those deals was of course Spanish renewable company Abengoa’s US$1 billion investment in the 200-meter-tall solar tower, Atacama 1, which is expected to generate an 110MW, and operate all day, every day. Abengoa is not alone in making the most of the opportunities. The 101MW solar facility in Amanecer – also in the Atacama – is owned by US firm SunEdison. Elsewhere, the El Arrayán Wind Farm, launched in late 2014 and one of the largest in the country, utilises Siemens-produced turbines to serve the energy needs of approximately 200,000 homes per year. Private involvement in Chile’s renewable energy market is without doubt on-the-up. Indeed, the last energy auction in October 2015 saw Abengoa, Aela Generacion (a joint venture between UK private equity investor Actis and Irish Energy Mainstream Renewable Power), First Solar (US), Ibereolica Cabo Leones (the local unit of Spanish energy group Ibereolica) and Solarpack (Spain) awarded 20-year contracts to supply 1200GWh to the Chilean electricity market from 2017. Chile’s policy enablement and renewable potential make it an attractive destination for European investors; so much so, that it was placed fourth in EY’s Renewable Energy Country Attractiveness Index (RECAI) – a quarterly publication ranking 40 countries according to a number of macro, technology and market specific indicators. And with an estimated 261 projects in the pipeline, opportunities are far from scarce. Of course, the natural place to start are those afforded by the more established renewables markets. A number of solar-based projects in Northern Chile remain in the pipeline and the country recently announced plans to develop a 1,865 mile transmission line to aid the transfer of solar power to other parts of the country. Furthermore, there are also an estimated 52 wind projects lined-up. Yet, there are also emerging opportunities beyond wind and solar. As the largest untapped form of renewable energy in the world, wave and tidal energy may also hold enormous potential – although technological barriers have so far held-back significant development in this respect. In addition, Chile would be an ideal location for wave energy research and development, while the country’s strategic position in the “Pacific-Ring of Fire” – an area of intense volcanic and seismic activity – leaves untapped potential in terms of geothermal power generation. Clearly, Chile is a treasure trove for renewable energy investment. But how can European companies and investors seize such commercial opportunities? Indeed, in the UK, a recent Department for International Trade (DIT) roadshow highlighted that access to world markets is not always unrestricted for exporters – particularly with respect to international tariffs and regulations. This is where banks, such as Santander, as well as organisations such as DIT and others in Europe, play a crucial role in helping businesses and investors to succeed internationally. With dedicated teams of specialists, they can provide a variety of services including help with export documentation and regulatory issues, assisting with cultural and language barriers as well working with exporters to understand and mitigate their trading risk profile. At Santander we also have a track record, across the globe, of financing the construction and operation of wind farms, solar photovoltaic plants, solar thermal power stations and mini-hydraulic plants – either through project finance or solar photovoltaic leasing. Such finance is essential if large projects are to move forward into the construction stage. Chile has the right resources and regulatory framework for successful investments. With the right expertise and financing, European companies and investors could make hay while the sun continues to shine. Mauricio Munguia is Santander’s Latin American Desk Head.